Caitlin Rother, crime author and former U-T investigative reporter, tonight (March 27) issued a longer statement on her role in an investigation that was done of Carl DeMaio prior to the November mayoralty election. On Sunday, the U-T printed a long story, suggesting that there was an unethical smear of DeMaio. Actually, a packet of information about matters of public record on DeMaio, and particularly on his partner, publisher Johnathan Hale (who has changed his name from Wykcoff to Hackett to Hale), was distributed to media. This is not uncommon in political races. Initially, "I thought I was signing on to do pure political research," Rother writes in her revised statement. However, the mandate then changed to having her do"legitimate balanced journalism." However, that didn't work, so she wound up just gathering public documents -- "good, bad or neutral" -- on DeMaio and Wykcoff Hackett Hale. "Once I was finished with my work, I stepped away," she writes. She says it is "ridiculous" she was involved in gay-bashing or gay-baiting. dotinga March 27, 2013 @ 7:21 p.m. Reality check. Various smear campaign internal emails are here: bit.ly/XfeDQQ and here: http://bit.ly/XfeBsi. Via the U-T. I know why other media in town ignored the smear campaign's allegations and insinuations about DeMaio's partner: They were gay-baiting, ancient and irrelevant. Why did the Reader not report them? Dorian Hargrove March 27, 2013 @ 8:03 p.m. I personally didn't because I didn't see any merit in any of it. That would have been the same if the same allegations were cast on a man or woman. No conspiracy here. Don Bauder March 27, 2013 @ 8:12 p.m.
Don Bauder March 27, 2013 @ 8:09 p.m.
dotinga March 27, 2013 @ 8:07 p.m. Cool. When the muckrakers at the U-T, VOSD, CItyBeat and the Reader all say "ewww," something might actually stink. Don Bauder March 27, 2013 @ 8:15 p.m.
dotinga March 27, 2013 @ 8:32 p.m. The story and what it reveals are the issue here. The U-T's motivations for running an obviously fantastic story, or what it might do if the players were reversed, are less important. Even so, I believe that many of the U-T's top editors and reporters, like Craig Gustafson, retain commitments to ethical journalism and aren't as easily manipulated and controlled by the men who run the place as critics like to think. Not that they're free to report and write what they want. Then again, neither are other journalists like you and me: if we're getting paid, we've got publishers and editors and they call the shots. Anyway, enough. Tell us more about vibrators in the Gaslamp! Don Bauder March 28, 2013 @ 7:02 a.m.
BradleyFikes March 27, 2013 @ 9:18 p.m. In an email dated May 28, 2012, Rother wrote: "so, word seems to be spreading ... this is odd because Evan McLaughlin told me they were trying to distance themselves from this. looks like they changed their mind??? Isn't that who is running this site??? http://dirtydemaio.com/node/139"
That doesn't square with Rother's description of her role as "legitimate balanced journalism." And if Rother really thought her work was legitimate journalism, why was she so keen not to be publicly associated with it? Don Bauder March 28, 2013 @ 7:06 a.m.
dotinga March 27, 2013 @ 9:51 p.m.
Brad: don't you always always produce your legitimate, balanced, voter-educating, public-service, unbiased journalism on an anonymous basis and try to keep your name out of everything? We journalists are known for our tiny egos, as you know. Don Bauder March 28, 2013 @ 7:13 a.m.
BradleyFikes March 28, 2013 @ 7:31 a.m.
Hi Don, Rother wrote more than one email mentioning those sentiments. She knew the assignment was to make DeMaio look bad. You should really read it all - it's linked at the end of stories in two PDFs. In particular, I suggest you read the scope of work for Rother's assignment, which she presumably read before accepting. It's loaded with derogatory references to DeMaio. There's a particularly juicy giveaway: The scope of work directs Rother to meet with "a small circle of trusted sources, including ideological allies of this project and other associates ..."
I'd be interested in hearing Rother's explanation about how "legitimate balanced journalism," can have "ideological allies." Don Bauder March 28, 2013 @ 1:25 p.m.
BradleyFikes March 28, 2013 @ 7:35 a.m.
Don Bauder March 28, 2013 @ 1:28 p.m.
gfalke1 March 28, 2013 @ 11:38 a.m.
As I advise all my clients and anyone else who asks, if you can't put your name on a statement or any work publicly and own it, you should refrain from participating. That's the test. Transparency is everything. Ms. Rother's assignment fails this test and she should have declined it. There is nothing inherently or legally wrong about opposition research in politics. Morally it's a judgment call for the individual. But you shouldn't label it as journalism. Brad, when the Koch Brothers are looking to expand their operative empire, give me a call. Don Bauder March 28, 2013 @ 1:31 p.m.
dotinga March 28, 2013 @ 2:03 p.m.
"We were not trying to smear anyone," writes Caitlin Rother. Does anyone believe that's the case and if so, why? Don Bauder March 28, 2013 @ 4:12 p.m.
BradleyFikes March 28, 2013 @ 4:23 p.m.
Don, How much does Roberts get? I plan to hold out for at least double. Don Bauder March 28, 2013 @ 9:31 p.m.
BradleyFikes March 28, 2013 @ 4:36 p.m.
Don, Rother's claim she was trying to turn opp research into journalism strikes me as a (very contrived) cover story. Remember, her role was supposed to be secret. That was a blatant deception by someone who presented a public facade of being just an impartial reporter. Why believe her now? As for the rest, of course politicians routinely dig up dirt on each other. But mixing opp research and putative journalism at the same time is a church/state violation. Don Bauder March 28, 2013 @ 9:37 p.m.
dotinga March 28, 2013 @ 4:53 p.m. I'm not aware of anybody who is shocked that these political smears go on. Perhaps you know someone who's expressed surprise? Plus the inane rationalizations of virtually everyone else involved and the (debatable) gay-baiting by a bunch of gay rights supporters. This will turn Carl into the world's biggest martyr. (Look at how far they went to tear me down! Look how much they spent for nothing! Etc.) Well played, everybody. Don Bauder March 28, 2013 @ 9:43 p.m.
dotinga March 28, 2013 @ 9:57 p.m.
As far as I know, the material in the report is irrelevant, ancient, salacious, obviously gay-baiting or some combination of the above. That's why none of the mainstream or alternative media (not the ultra-anti-DeMaio/leftie media, not the right-wing media, not the other media, not the whatever-the-heck-the-Reader-is media) bothered to report on it except for an obscure DeMaio-despising outlet that fell for it hook, line and gay-baiting talking point. Don Bauder March 29, 2013 @ 9:07 a.m.
BradleyFikes March 29, 2013 @ 7:39 a.m.
Don, I don't see anything wrong with Citizens United, which simply allows people to use their money for political speech. It seems like good constitutional law to me. I do think campaign contributions should be disclosed and put on the Internet ASAP. 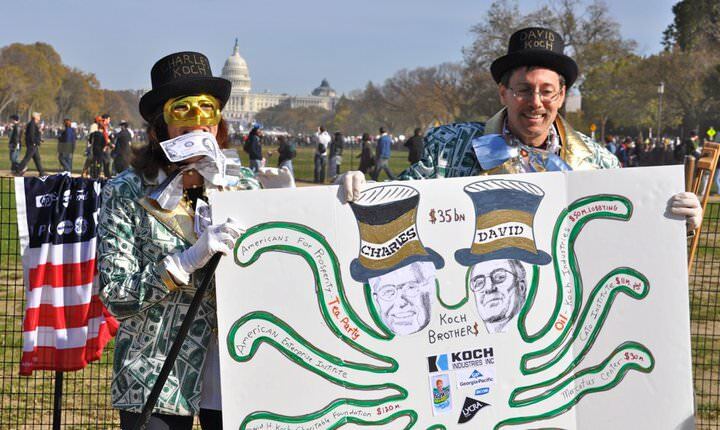 The leftie media's frenzied attacks on CU and the Koch Brothers is just politics. They just hate that the libertarian cause has backers whose wealth eclipses even George Soros. (As you probably know, the Kochs lean libertarian; Charles Koch was actually on the vice-presidential ticket of the Libertarian Party in 1980). Don Bauder March 29, 2013 @ 9:10 a.m.
BradleyFikes March 29, 2013 @ 7:48 a.m.
Don, You wrote, "She started the job as an opp researcher." But in the U-T article, Rother said: "I also want to note that at the outset, I was brought on board with the assurance that, according to campaign attorney Jim Sutton, this project was apolitical and legally protected under the First Amendment and the Citizens United case." I can't reconcile these apparently conflicting statements. But maybe you can explain how they can both be true. Don Bauder March 29, 2013 @ 9:21 a.m.
Bradley: Admittedly, it is difficult to reconcile those statements. An opp researcher is not working on something that is apolitical. Unfortunately, she cannot defend herself because she is not saying anything. dotinga March 29, 2013 @ 9:53 a.m.
Don: Why don't YOU publish the "very important information"? Don Bauder March 29, 2013 @ 10:35 a.m.
dotinga March 29, 2013 @ 1:38 p.m. Translation: There is deep, dark and horrible important information about these people, but I can't write about it because of ethics constraints. That's dirtbag journalism. This can't be right. I suspect the real Mr. Bauder is being held hostage by some evil forces and this is an imposter. Get a message to us if you can, Don! We will rescue you! Don Bauder March 29, 2013 @ 3:54 p.m.
dotinga March 29, 2013 @ 6:35 p.m.
Of course you didn't say that. You didn't have to. Don Bauder March 29, 2013 @ 9:55 p.m.
BradleyFikes March 29, 2013 @ 9:41 p.m.
Don, I just don't see the evidence that Citizens United endangers anything. The political left hyperventilates about how CU allows gazillionaires like the diabolical Koch Brothers to buy elections. But the record of gazillionaires in buying elections is decidedly mixed. Just ask Vice President Charles Koch, Senator Michael Huffington, Governor Jane Harman and President Mitt Romney. Don Bauder March 29, 2013 @ 9:59 p.m.
BradleyFikes March 29, 2013 @ 10:57 p.m.
Hi Don, You wrote: "Unfortunately, she cannot defend herself because she is not saying anything." -- What kind of "legitimate balanced journalism" would concentrate on the "negative information" and rely on other reporters to find positive information, as Rother claimed was her intent? -- Why would legitimate journalism require contracting through a campaign committee? -- What is the text of the updated scope of work Rother refers to in her statement? -- When was this updated scope of work adopted? -- If such an updated scope of work actually exists, why wasn't it in the documents released by the FPPC? I believe Rother's assertion that she didn't want to be associated with anything but a pure information-gathering project. "Associated" is the key word -- such statements require careful parsing. Far from being a reluctant opp researcher, Rother even implied in an email that she would like more such assignments. She just wanted her name kept out of it. As Gayle said earlier, "transparency is everything", but Rother wanted opacity. Given such huge holes in Rother's story, I think you've needlessly committed yourself to defending her veracity. Regardless of what you were told off-the-record, you would be entirely within journalistic ethics to maintain a discreet silence. Don Bauder March 30, 2013 @ 7:58 a.m.
BradleyFikes March 30, 2013 @ 12:57 p.m.
Don. So unskeptical reporting about Rother's statement is fair, but pointing out the contradictions in her account is "nitpicking". Don Bauder March 30, 2013 @ 2:44 p.m.
dotinga March 30, 2013 @ 4:16 p.m.
For some reason, Don is unable to pursue the questions he raises. Free Bauder! Don Bauder March 30, 2013 @ 5:20 p.m.
dotinga March 30, 2013 @ 8:10 p.m.
Are there or have there been connections (romantic, financial, family) between current and former Reader journalists and current and former politicians, lobbyists, p.r. people, movers and shakers? Especially people the Reader has covered or does cover? You know, the kinds of connections that the Reader loves to unravel when they involve other people. Don Bauder March 31, 2013 @ 7:49 a.m.
BradleyFikes March 31, 2013 @ 10:48 a.m.
Once upon a time there was a wonderful forest in a magical land called Dona Egis. The weather was balmy, the crops hale, and noisome dragons lived far away in the fetid, troll-infested swamp of Nos Alleges. Until one day, when the town crier spread word that the forest was afflicted by a mysterious blight. Immediately, the magicians, apothecaries, soothsayers, thaumaturgists and hierophants went to work discerning which trees were blighted. "These trees!" said the magicians, consulting their magical tomes. "No, those trees!" said the soothsayers, reading the entrails of goats. "What blight?" said a few. And so on. At last, a venerable but hale woodcutter/scribe raised his voice. "While there is indeed a blight in the forest, I am absolutely certain that one tree is free of this dreadful scourge," said the woodcutter/scribe, named Daubed Nor. He gestured to a willow tree by a creek, called by the locals the Rives Organdie. "Now go investigate these other trees," he said, reading from a list. The locals pondered this news while sipping their mead, a tasty Robing Newest. They respected the woodcutter/scribe not only for his forestry skills, but also for his work at Rhea Detre, a venerated scribe guild. "But look at the cankers on the trunk!" cried a humble scribe apprentice named Dryad Atoning. "Shouldn't you examine this willow tree more carefully?" The wise old Daubed Nor shook his head knowingly at the credulous whippersnapper. "Nay, you have been bewitched by my trickster rival, Ancestral Gumshoed!" Nor cried. "Go investigate the other trees! Why would you want to examine this fine poplar when I've declared it blight-free?" Don Bauder March 31, 2013 @ 1:53 p.m.
Duhbya April 2, 2013 @ 11:01 a.m. This is a classic. Good for a thousand chortles. Might I be forgiven for suggesting an alter ego for Ancestral Gumshoed? The ebullient one known as "A Macerated Hung Pops". Don Bauder April 3, 2013 @ 4:26 p.m.
Duhbya April 3, 2013 @ 11:04 p.m.
Good one yourself, Baron Dude. Don Bauder April 6, 2013 @ 7:45 a.m.
Duhbya April 8, 2013 @ 5:04 a.m. Which I probably would have revised to "Bawdy Buddy". Don Bauder April 13, 2013 @ 6:53 p.m.